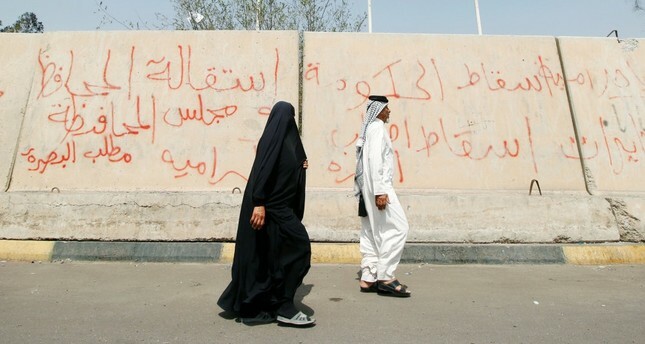 People pass near graffiti painted by protesters after a week of violent protests, Basra, Sept. 9. Iran has been pursuing a sectarian expansionist policy in the Middle East for years now. Following popular uprisings in the Arab world, mostly associated with the Arab Spring, Iran found an opportunity to increase its influence and shape its policies more actively. Besides aiding the Syrian regime through Shiite militias, Tehran has been involved in Lebanon's domestic policies. Yemen is another example of Iran's policy. Then there is neighboring Iraq, where most politicians have received aid from the Iranian regime. However, the recent incidents in Basra show how Iran's sectarian policy has been rejected, even by the Shiites of Iraq, let alone the Sunnis, who have faced a number of difficulties and even atrocities under the sectarian policies. Residents of Basra poured into the streets and clashed with security forces after their drinking water was polluted. The demand was clear: "We need jobs." The city is one of Iraq's oil-rich regions, but its residents live in dire conditions. The city lacks basic infrastructure, facilities, and the residents suffer from insufficient job opportunities. The oil refineries are run by foreign companies that employ foreigners. While Basra's refineries are making billions of dollars, its residents remain in unprecedented poverty. Recently, the protesters attacked government buildings and set a number of political party offices on fire. Their anger was directed at the Iranian consulate, as well. The protesters torched the Iranian consulate and, as a result, Iran closed one of its border crossing with Iraq. In the videos of the protesters that went viral on social media, anti-Iran slogans can be heard and some of the activists blame Iran's growing influence as one of the main causes of the problems. People of Basra are fed up with the growing power of the Iranian-backed Shiite militias that tried to silence the protests. The words of a Shiite militant, Abu Yasser al-Jaafari, revealed the stark differences between the residents and the militants. He said, "We will respond to the acts of arson and sabotage." The Iranian-backed Shiite militias, known as Hashd al-Shaabi or the Popular Mobilization Forces (PMF), has been accused by several rights groups of war crimes, atrocities, kidnappings and many other crimes in several parts of Iraq, especially against Sunnis. They are also known for their direct ties to Iran. Although the Iraqi government has promised to overcome the problems and listen to the protesters' demands, it does not sound realistic as the country is engulfed in multiple conflicts – mainly, against Daesh, which even though was mostly repelled, has heavily damaged the country's economy. In relation to the emergence of Daesh, the fact that the PKK gained more ground in the country's north has led to a diplomatic stalemate with Turkey. The desire for independence shown by the Kurdistan Regional Government (KRG) is yet more cause for trouble. The Syrian civil war has shaken war-torn Iraq's economy and security. At the same time, Baghdad is under the influence of Iran and Tehran's proxy groups continue to act independently from the government.